myjhola - Traditional Indian food recipes, Baking recipes, Recipe videos, and Fiction. As grandmothers go, she fit the bill perfectly. Her softly starched, block printed or sheer woven Chanderi sarees would whisper as she walked slowly around the house, depending heavily on her walking stick, her arthritic feet protesting every step. The four thin bangles around her wrist had thinned with age and hung loosely over her paper-thin skin and seldom made their presence heard. A lingering freshness of Yardley Lavender calmed you down as she hugged you after a hot, hurried walk to her dark, softly illuminated house from school. Her wavy hair was neatly pulled back in a bun that got scantier over the years but always looked just as graceful, a bobby pin or two holding it in place. A smile that reached the eyes—her loving yet mischievous eyes, a sense of beckoning that only grandmothers are capable of. Except, she wasn’t my grandmother. Phyllis Marr came into our lives as Radha Gore—my maternal grandmother’s aunt; and therefore, my great grand-aunt. Together with Madhav Kaka, they formed our third set of grandparents; and perhaps the most accessible of the lot because they lived in the same suburb and we got to see them more often. N-16 was just a ten-minute walk from school and thus, closer than home. When one was particularly ravenous after school or had run out of rickshaw money or was too lazy to walk home, one hop-skip-jumped to Radha Kaku’s house. Invariably, a parent would come and pick us up later or we would get a royal ride home in Madhav Kaka’s roomy old Ambassador with pretty lace curtains that fluttered gently, gracefully, in a barely-there breeze as he drove slowly along Vashi’s generous, tree-lined roads. There were always two things on the table at N16—a spray of fresh flowers and leaves from her little garden, and food. The kitchen was hardly ever silent—food was always being made. Or being planned. Or being eaten! All my memories of her are associated with food. Something for an after school snack. Something for the way home. Something now that you’re here. I distinctly remember a time when Amma had to go away to be with my aunt, who was very sick and my brother and I stayed back so we weren’t in the way and were fruitfully occupied at school. Baba would have to go to work all day and our paternal grandmother came to help for a few days. School hours ended at 6 p.m. and after a brief half-hour break, I would have to go to Bharatanatyam dance class in the same premises. Usually, Amma would come by with a change of clothes and a snack, and I would slip into dance gear in one of the deserted classrooms. While she was away, Radha Kaku offered to do snack duty. I carried my change in the schoolbag. At 6 p.m., I would walk out of the school gates and step into Madhav Kaka’s Ambassador. I would be handed a cool, damp face towel to freshen up. Kaku always carried these on train journeys and long drives, neatly packed in a plastic bag. Those were the days before disposable wet wipes came into the market. Once suitably freshened up, the lace curtains on the windows were drawn up and I would change into my Co-Optex material salwar kameezes stitched by the local darzi, in the car. (I could have just as easily dashed back to school to do this, but one didn’t ask questions back then.) By the time I settled back into my seat, a napkin (with an embroidered flower in the corner nonetheless) would quietly make its way to my lap. A picnic basket full of variously sized dabbas would be opened and a degustation would begin. First, the mandatory milk—a glass bottle with a sunset colored plastic screw top lid, Bournvita embossed proudly across its diameter, filled with the malt powder-flavored milk. The bottle would have been kept warm by wrapping it snug in a napkin. I would have attempted feeble protests had Amma brought it along but with Kaku lovingly beta-beta-ing me along, I couldn’t. Next, the main course—warm aloo tikkis with a tiny dabbi holding ketchup or vegetable sandwiches with a fresh green chutney and crisp vegetables. Or cheese toasties. Or a paneer filling inside a warm, soft phulka, freshly made. These, I would wolf down in part hunger and part greed. Kaku’s cooking was always mildly spiced and full of flavor and warmth. Quiet sophistication whispered out of the simplest of dishes she made. Planning and cooking meals came naturally to her or so she made it seem because she never looked flustered or in panic when sudden guests arrived. Standing at the stove, she never looked anxious about how the dish was turning out to be. She was always confident and happy that she was cooking for somebody. Even when her arthritis had severely reduced her movement, she would meticulously monitor the cooking or muster up the energy to sit at the dining table and line a pie dish or stretch pizza dough or dress a salad. She taught me the importance of birthday cakes. She always made the effort to bake a cake for everyone’s birthday—even the house help’s. I usually got a pie because Amma would have baked me a cake and Radha Kaku would have probably not wanted to repeat a dessert. I remember this once she hand rolled each individual letter of “Happy Birthday” and stuck it on the crust of the apple pie before baking. With her severe joint pains, this must have been painful or at least, annoying but she knew it would make a child feel special so she did it. It is something that has stayed with me all these years. I still make sure, no matter what, that every single person in the family gets a homemade cake for their birthday. And the joy on their faces is something I owe Radha kaku. This is an heirloom recipe (first printed in a limited edition, privately circulated book I collated for my family–The Gore Family Cookbook), handed down to Radha kaku by her mother and can be traced back to at least a century, and probably has Scottish roots. 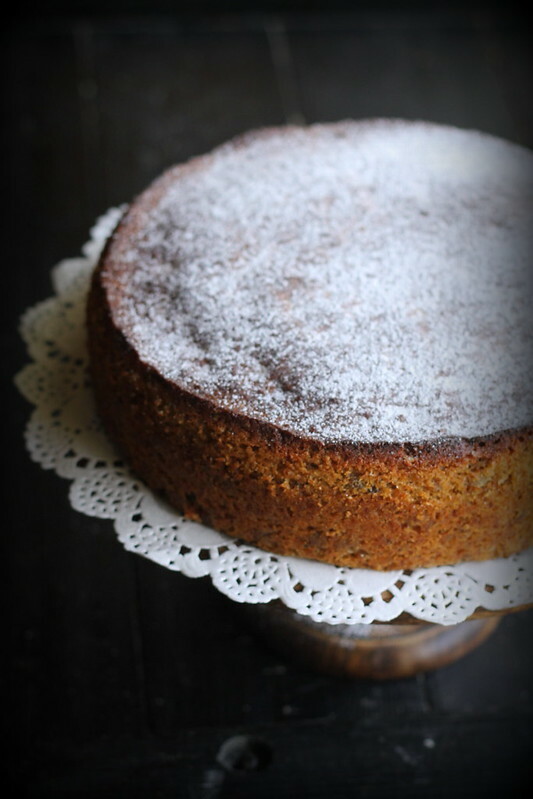 Like all old-fashioned cakes, this one does not have any raising agent such as baking powder, and any lightness is only achieved by incorporating air by beating the eggs and creaming the butter and sugar well. 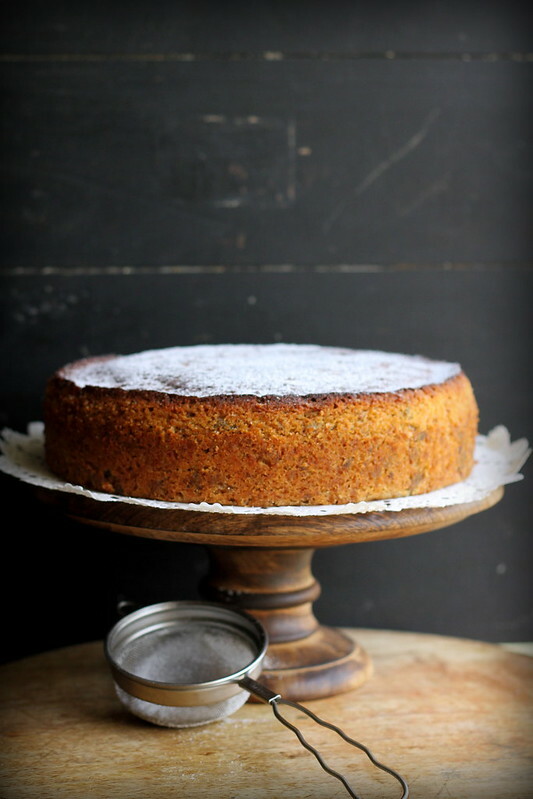 Nevertheless, the dense texture of the cake is its endearing characteristic. Look how the early versions of Christmas fruitcakes in India had Petha as an essential ingredient to make up for the limited variety of locally available dried fruit! Soak all the dried fruit, candied peel and candied ginger in half the rum or cognac for a minimum of 3 days (the more the better—mine is soaked for a year). Petha does not require soaking. Sift the semolina, flour, and ground spices twice. Place the sugar and butter in a food processor or stand mixer with the paddle attachment and cream them together until light and fluffy. Add the eggs, one at a time and beat at a low speed, incorporating one completely before adding the other. If, at any point, you find that the mixture is curdling, quickly add two tablespoons of the flour mixture and continue. Add the flour and spice mix, one large spoon at a time, mixing gently but surely to preserve the aeration. Add the petha, slivered almonds, and soaked fruit a little at a time and mix well. Pour the batter into greased and lined tins. Bake at 150 degrees centigrade for one hour or until the top is a rich gold and a skewer inserted comes out clean. Cool completely, and wrap in absorbent paper or parchment. Do not wrap in plastic. Keep for a month, allowing the flavors to mature. Prick with a skewer and drizzle more rum every few days for a deeper flavor. All content, including images and videos, on this blog are the sole property of Saee Koranne-Khandekar. Please seek permission in case you want to use any content.